We drove home from Ventura yesterday morning. As we neared the Gilroy Outlets we started wondering if they didn't have a Pearl Izumi Factory Store. Sure enough, they did. We had to stop, right? They had a lot of great stuff. It seems like most bike and sport stores have a lot of similar items. I don't see fun, pretty, unique cycling clothes in the stores very often. 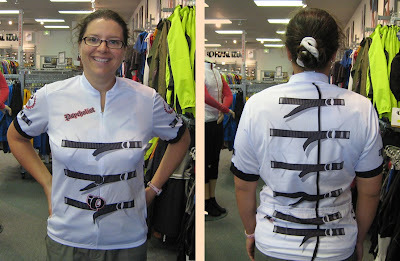 Well, I found a couple of cycling jerseys I really like. One was on clearance, which is good. The other was full price, which was not so good but I love it. The new jerseys will have to debut on here when I wear them on actual rides. But, I did snap a picture (shocker!) of one of the jersey's I thought was really fun. If I was made of money I would have purchased it but, alas...just a picture. Isn't it neat? Those are straight jacket straps. It says Psycholist on the chest. Being a psychiatric social worker and all I find the straight jacket theme particularly fun. Not that I advocate straight jackets. Please don't take me seriously. We got home around 7pm and I was feeling pretty wiped from sitting in the car for 5+ hours. Miguel drove the whole way so I'm sure he was more tired than me, at least I had a small nap on the way. But, I had a run on the schedule, 40 minutes. I've never run that long, ever. As soon as we hit our block I told Miguel, "I have to leave right away or else I won't go. Do you mind unloading the car." He told me to skip it, that I was tired. No can do Mister, "but I'll just take plenty of walk breaks." I went in and changed and started my warm-up walk. I was feeling very grateful that I have such a kind husband. He drove all that way and then put all our stuff away and started the laundry all by himself while I was gone. Let me tell you about the run. After the 5 minute warm-up walk I started jogging. Immediately my legs felt stiff and moving them was not easy. I thought, "there's no way I will be able to jog for 40 minutes". I decided to just jog until I couldn't. One of the suggestions in my training guide says to take your walk break before you get tired. Since I don't really have that well established I decided to jog until I was beat and then take a walk break. The next time I'd take a walk break 2 minutes before whatever that time was. I was going to do a loop route that included a big hill but decided to do an out and back loop, turning around at minute 20. This way I could bypass the hill (do I need to face a big hill on my first longer jog? No, I'm not a masochist and I want to keep liking this) and have that good feeling after turning around of knowing I'm heading home. Psychologically that's powerful stuff. I got about a mile out and started to think, "ya know, I might be able to do this." I think once my legs got warmed up everything seemed better. I jogged for 20 minutes and turned around to head home. I knew at that point that I would make it. I jogged the whole 40 minutes! And I could have gone longer. I know one factor, I was probably jogging a heck of a lot slower than I do on the treadmill. I just went and put my route into Gmaps Pedometer and figured out I jogged 3.75 miles. Then I found a Speed/Distance/Time Calculator and guess what? According to the calculator I was jogging at 4.755mph! I figured I was probably going, like, 3mph or something silly. That's not that much slower than the treadmill, where I jog 5mph and have to take walk breaks. I think I'm going to slow my treadmill down to 4.75 from now now. I liked being able to jog without stopping. Yay! I felt victorious when I came home. Being that the jog was outside and that I didn't have to stop the whole time and that this was my longest jog ever, I felt like this was my first "real" run. Double Yay! So today, Monday, I had a swim and a bike on the schedule. Ya know, this training makes me feel totally different about exercise. I feel compelled to do it in a new way, with new drive, new motivation, and a new sense of the drive coming from within me, not from some outside, I should exercise kind of thing. And that feels good. So my training guide recommends splitting 2-a-days up into seperate sessions if possible. It does have some bricks in the weeks before the tri but for now, separate sessions if possible. So I got up this morning and was waiting at the pool when it opened. I did my 26 minute swim (well, 28). It felt really good to get some exercise first thing in the morning. Good lord, look what I've become. Now I'm just waiting for the weather to cool a bit before I head out on my 53 minute ride. Miguel's going to go with me and we're talking about riding some of the bike route. It's so nice to be doing a local tri where I can train on the actual route. Alright, I have to go change. Oh, maybe I'll where one of my new jersey's :) Look for a picture soon if I do. I'm very impressed by your dedication. I find it very motivating. Perhaps I'll start doing the schedule I set out for myself. I can't wait to see the new shirts! That one is kinda crazy ...ha.. no pun intended!! You're a real trooper, getting in that run -- and run the whole way! I hate you and all your great motivation!! Just kidding. I am jealous though. I love that feeling and I'm really missing it. Way to go on the run!! I don't think I could have done that. nice job on the run! I have found if I'm feeling lousy at the beginning, I think, I'll just do 10 minutes and see how I feel. Same trick works when I don't want to get out of the house...I'll just run for 10 minutes....almost every time I end up feeling pretty good and doing a much longer run. nice job with the 40 minutes! I know what you mean about " if I don't do it NOW, I won't do it at all". Also know what you mean about being reinvigorated with training. That is so nice when it happens. Sometime I think training for three sports helps -- mixes it up a little. Two-a-days aren't so bad once you get used to them. And they give you AWESOME bragging rights. Great job...the 40 minutes is awesome!